At the age of 34, I've accomplished what few others have not and I intend to do a few adventurous and challenging activities before my retirement age and I have not set my retirement age yet. Once again, I'm the only Bruneian participating in the race. 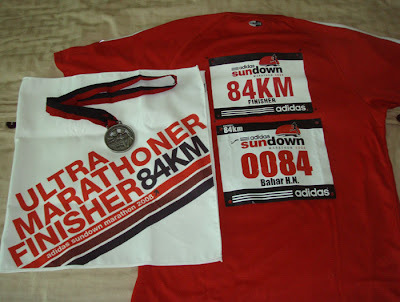 My 2 sets of running attire with my customized BIB Number. We (me and the Mrs) arrived on thursday night and the hotel is just 10 mins away from the airport. We stayed at the Changi Village Hotel - the official hotel for the event. The hotel is very far from Orchard Road and is cost $20 daytime and most probably $30 night time. Friday morning, we went to the Athlete's Circle to pick up my Goodie Bag. It's a small sport shop selling specialised sporting equipments. Shop like this can cause me to spend more than a hundred dollars (i did). so many things sold at a reasonable price. bicycle jerseys, bib number waist belt, Powerbar gel and bar and so many more. hilang akal olehnya. 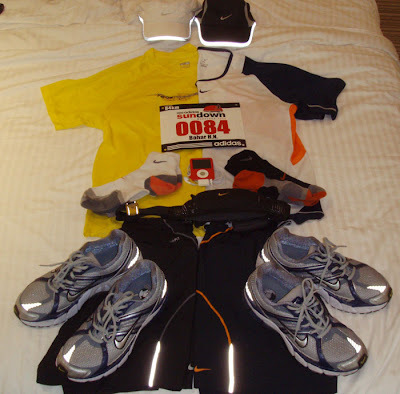 The picture above - my 2 attires - the yellow t-shirt for my first 42k and the white black/orange stripe for the other 42k. The waist bag was for carrying my powerbar gel (5 packets) and my mobile. I also wore a bib number belt so that I don't have to pin my bib number to my t-shirt. rosak saja baju. Pictures taken infront of the Changi Village Hotel. 200m to the finishing line. The pictures above was taken by my wife. I phone her half an hour before, telling her I would be passing by infront of the hotel. I dropped off my bag at the Ultramarathon pit stop tent. After that, cari toilet. biasalah nervous punya pasal, perut pun turut membuang. aahhhhh...legaaaaaa. That night sepanjang perlumbaan, aku ke toilet around 10 times plus dua kali mendeposit (perut kurang baik) and some of the time I'll just pee by the tree sides (by the way, it's night time, so nobody can see). I was too lazy to buat warm up so aku stretching saja. I want to conserve my energy. There was so many people at the starting line up. It should be only 300 plus runners for ultra marathon, this is like 700 runners. I look at their bib numbers --- ohh oke, corporate and team event runners - 10.5km. It should have been 8:30pm but they flag us off 4 mins earlier. I timed my Nike+ ipod and my Timex watch. Everbody was running at their own pace and those 10.5k runners are running extremely fast paced. I cannot tell who is doing the ultra or the 10.5k until the first checkpoint at 5km. the 10.5k runners headed back to the starting point and the rest of us to the road of endless running. 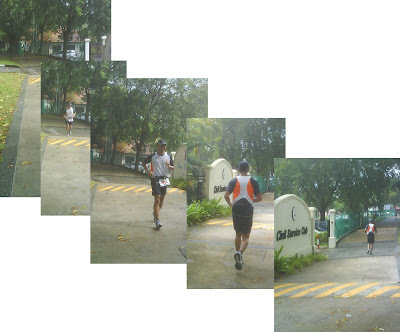 The running path are centered mosthly around the backside of Changi Airport, the east coast park and a few other areas. The Changi Coast road - it's a long stretch of road with built in runners/cyclist/skaters pavement by the side of the road. That night, I saw a lot of cyclists doing their training and some are with their aero/TT bikes and some are still riding in the early hours of the morning. From what I saw, this side of Singapore - the eastern part are built for sporting activities. Even the traffic is not so heavy here compared to areas like Orchard/Scotts road. Next, i pass by the East Coast Park - a fully developed seaside beach. Singaporeans do really know how make full use of their small island. There were soo many campers as if that night there was a celebration. I guess every saturday night it's like that. 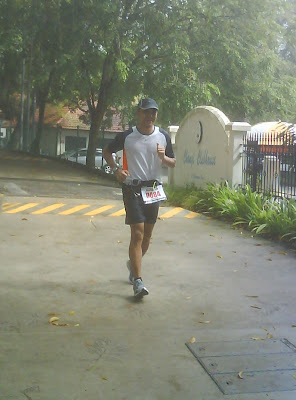 The first 5km, my time was around 30 mins, 10km- 1 hours plus . Good i'm on time. After 25k, my foot start to buat hal.sakit tia jua. So aku buat walk/run/walk but most of the time aku berlari. i walk only 2 to 3 mins. By 30k, i feel pain and slight numbness in my feet. My thigh oke aje. It was already 4hours after the flagged off and I have 12k more to reach the first 42k. By 38k, i was already calculating that I will not be able to finish in time. Why? My legs are in pain (thanks to very little training - the farthest training I've done was only 21k). I've decided after 42k checkpoint i'll just do 1k at a time until 50k then dropped out. I reached 42k checkpoint at a time of 5:45 hours, everybody was cheering and urges me to continue my run. I changed to my second attire, wash my feet, give some deep heat rubbing cream (nyaman nyaaaaaaaaaa), rest for about 10 mins and way I go for another 42k of endless pain. I was still running or was I walking.....i was running very slow. Mentally, i was ready to give up. So at the 50k water checkpoint, I took a chair, sit down and stop my Nike+ ipod and my watch timer. Take off my shoes and socks, that's it.....i give up. 50k is enough for me. I cannot finish on time. It took me 1:30 hours just to reach from 42k checkpoint to the 50k checkpoint. I was sitting there - runners passes by and none of them even ask me how i was doing. There were 5 volunteers at the checkpoint - 3 were sleeping, 2 were talking and they didn't even ask me how i was doing. After 30 mins of sitting down, I've decided that I should continue my journey of pain. It's still early. 6 hours to complete 30k - 2hr per 10k. I can do it. At first I ran slowly and it was painful. What if I ran a little bit faster, will the pain go away. 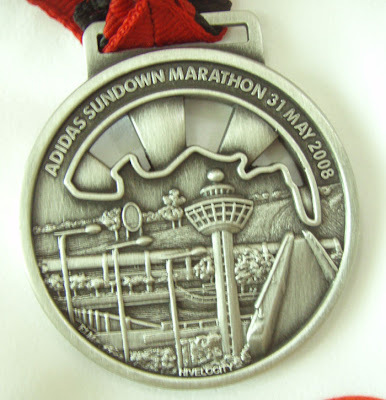 So did it and pass by a lot of runners and everytime I pass by them, i would say, we can do it 30k in 6 hours. budak ni dah gila atau terlebih makan powerbar. Most of the 30k, I did more walking compared to running. Fast walking bukannya berjalan kekadai. The last 12K was the hardest. It took me 15mins just to cover 1k. that is very slow. At every water checkpoint I tried to rest for few minutes. 800m to go. It started to rain, so it help to cool down the body. I tried my hard to run eventhough rasanya macam bejalan jua. My wife was already waiting for me in front of the hotel. Senyum saja masa kana ambil gambar eventhough masa atu kaki penuh dengan kesakitan. I ran to finish line in pain. Yeahhhhh.....i finish it. As for now, I would say, this will be my first and last ultramarathon. No more. enough. I completed my run in 14 hours 15 minutes 55 seconds with less than 15 mins of cut off times. Lastly I would like to say thank you to my wife, families, friends and bloggers who have supported me. And I would like to say Thank you very much to my sponsor. Next time sponsor lagi. tak tahulah aku nak cakap betapa bangganya aku ada member boleh lari sejauh ni. 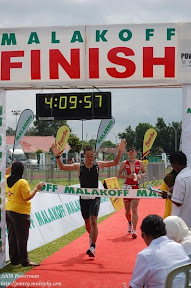 we are proud of you, one Bruneian who made it as an ultraman. Hubby and I envy you at this stage. We'll see you at the half marathon in august!!! Definitely. It's been fun reading your blog. I hope it's not to late to say "Congratulation!" Bangga ku eh ada wakil Brunei sanggup menghadap cabaran Ultraman ani. Keep it up Bro, kami sentiasa support u.